In 1928, Ester Nordhammar had the idea to start a simple patisserie. 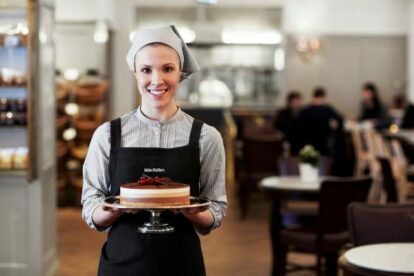 Ester was asked what her bakery would be called and answered: ‘Ja, det vete katten’, which in Swedish can mean both ‘the cat knows’ and ‘the wheat cat’. Somebody must have liked the spontaneous sound of this and so its name was born. As I enjoyed the warm ambience, the decor dates back to an era where things were quite simple but stylish. This must be why many Stockholmers come here on a regular basis to get a glimpse of fika history. The place smells so good. Dominated by sweet cardamom and cinnamon, I had a ‘regular’ homemade cheese sandwich for lunch with a fresh-pressed juice. I could definitely go back there and organise an afternoon with friends or family and try some more pastries, chocolate pralines and some great coffee. The warmth of the staff made me feel very welcome and at home.